As many of you know, I'm always on a look out for ways to bake without adding too much sugar since my son can't eat too much of it. We're always watching his intake so on days that I bake, we have to make sure he had enough exercise to burn off all the sugar. This can be a challenge and definitely weighs heavy on my mind. This is one of the main reasons we moved to Austin, so that he would have more time during the year to play outside. This seems like a weird set up for these Cocoa Nib Scones, but I swear it makes sense! So in an effort to create this with less sugar and since he doesn't have a chance to eat chocolate chip desserts as much as he likes, I thought that a cocoa nib dessert would help. Cocoa nibs are basically roasted bits of cocoa beans that taste very much like chocolate chips, but without the sugar! hurrah! They have a slightly bitter, nutty flavor, similar to a very dark chocolate. But are packed with antioxidants, and fiber- so added plus! Full disclosure: I did add a bit of mini chocolate chips in this batter to really sell it to the kids, bit it's mainly cocoa nibs. So you can choose what amount you want in your scones. I'm always looking for cute food ideas for the holidays. And Valentines day is no exception. How many things can I cut into heart shapes!? Strawberries...Tomatoes...and Mini Raspberry Scones! Yes! These are so cute and so delicious, it's hard to not eat them all in one sitting! 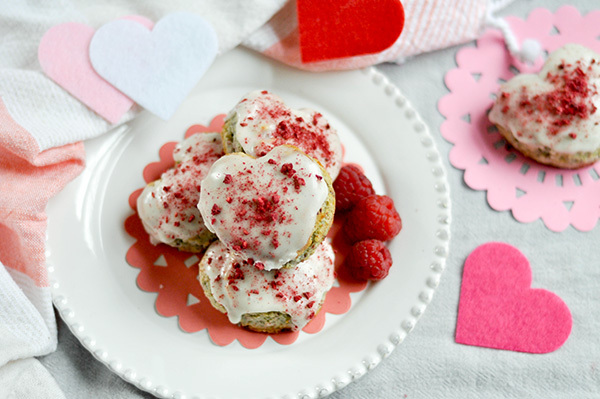 They are reminiscent of those cute little vanilla bean scones at Starbucks. But for a dollar each, it's waaaay easier to make them at home! Also that way you have 2 dozen scones to share... or scarf down on your own. Which is not what I did...nope... if you ask, I will deny it.